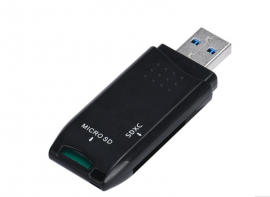 2-in-1 USB 3.0 SD / SDXC / Micro SD (TF, T-Flash) Memory Card Reader : allputer.com - Accessories for all your Portable Electronics & Computers! - This is a card reader, no OTG functions. - Only White and Black are available for Retail orders!